These Gateways continue to open us up to more, more, more. Cosmic Triggers are synchronized events, when Galactic, Solar, and Planetary factors align and create an opportunity to accelerate the Ascension. Thursday’s Cosmic Trigger was strong; I felt I would disappear into the bliss-realm. Fortunately the activity of snowshoeing up to a Gate spot grounded me a bit (cardio can be effective breathwork.) Solaris opened up with a major solar eruption early Saturday; our usual cosmic activity during these Gateways continues. This initiation into our seven-week transitional phase has intensified the Higher Light again. Gaia (and our ears) are ringing in the cosmic alignment. We cannot effectively describe this experience in linear terms. The ecstatic, merging-with-Source aspect of this Divine return is comprehended thanks to millennia of creative expression. When we combine it with (uncomfortable) cellular transformation, lightbody and heart center expansion, time collapse, collective veil-lifting revelation and a planetary dimensional shift, our experience escapes the realm of accurate description. And yet we persist, providing as much balance as possible during this mentally, emotionally and physically challenging phase of our Ascension. Underlying the whole experience is the awareness; We are really doing this, what a marvel to witness it in the physical. Gateways have similar light ray attributes this year, the culmination of years of New Earth Grid activation. Many are seeing these rays due to collective pineal and DNA activations, and asking about their purpose. Note the changing, higher quality of Light stepping forth as the classic 12-Ray systems shift to accommodate the New Earth. These light frequencies are bridging levels of consciousness, assisting us with embodiment and merging our awareness with our multidimensional Self. You might see them, hear them or feel them; whatever is in alignment with your journey. 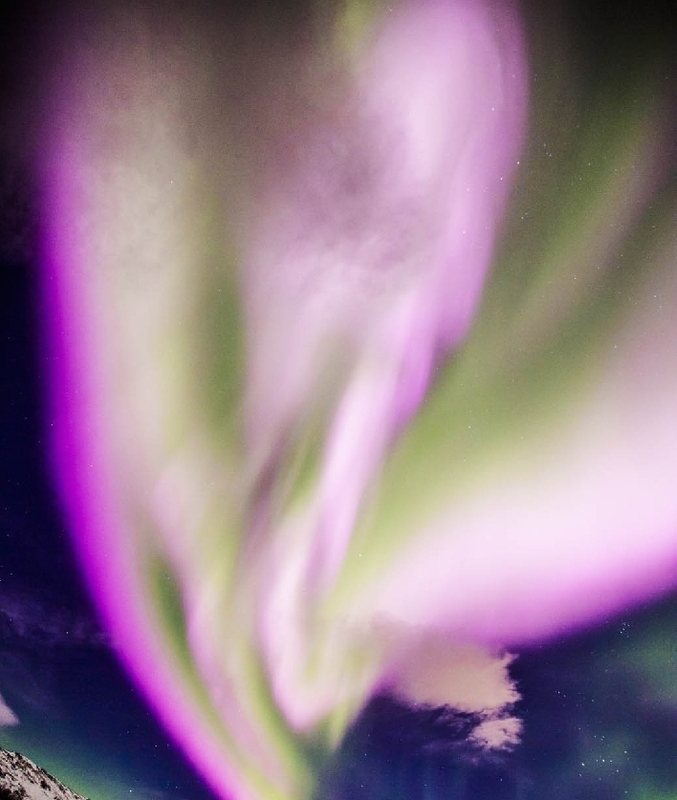 New pink-green auroras over Norway this week – a reflection of the new balancing light? Photo by Marianne Bergli. The New Emerald Ray: This is the 5D Divine Mother/Divine Feminine frequency, the background energy for creation. In our experience, we see it as a bright emerald-green, almost green-gold at times. This new level of the pure emerald ray frequencies is present in most activations now. For two years, we have been placing and using raw emeralds along the New Earth grid systems to receive this influx of pure balancing light. Its purity and strength provides a strong photonic reordering effect as it floods the gateways and grid systems. Raw emerald pieces are inexpensive, use them with the intention to assist Divine Mother. The Magenta Ray: The Gateway to 5D. It has a Divine Masculine balancing function (the action of creation) and appears as swirling, dancing light. It is the harmonious compliment to the emerald ray. You may remember my sketches of this from a few years back. The Diamond, Platinum or Crystalline Rays: Pure Ascension frequencies for Unity/Crystalline/Christ consciousness. Platinum has an effective clearing and protective function. Diamond and Crystalline Light stimulate the torus fields, DNA, and assist in opening the Ascension column for multidimensional awareness. They are consistent in Gatekeeping and Gridwork, and unify us with the Crystalline Grid around the planet. Our Ascending heart center and energy fields look like crystalline-diamond torus fields. Your Higher levels might use them to connect with you during the Unity Meditations or private meditations. They light up the Ascension column with vibrating, flashing light during upgrades. The Golden Christ Ray: This ever-present Christed DNA activator is amplifying again. It resonates with Divine HUman DNA, and activates it. It is a carrier frequency for the Solar Cosmic Christ aspect. Sometimes it appears as liquid light. Solar Plasma: This appears like vibrating walls of 5D rainbow colors. Pastel or pale hues of emerald, magenta, aqua, gold, pearlescent, crystalline, coral, and the platinum hue may be seen. While solar plasma can be used for sealing or protection, it is also an excellent delivery system for light codes and intention. It complements the elementals (because it is one). Before the California drought-relieving storms began last year, I saw myself in my seamless garment, standing on a Pacific beach, raising up massive vibrational sheets of Solar Plasma to assist with balancing the elementals. Experiment with it for healing. Pure Photonic Light: The highly-charged particles of light in this dimensional-shifting, consciousness-shifting area of the Galaxy. They may present as light filaments, thin beams of light, fields of glittering particles or intense pin-points of light. These streams of unique light do not fit in the categories described above. They are not visible (yet) to the linear eye. This light feels different; it has a very unique quality and light signature. When I asked what this new light was, the Team described it as pure photonic light. All of these flash or vibrate as pure living light during Gatework, Gridwork and meditation. They are not the only rays or colors in use right now, this list is intended to answer questions about recent visions and changes in the incoming light. When the Unity Meditations began in 2016, we were told it would teach us how to connect without the need for internet or devices. Now we can feel each other on SUNdays and share visions, sensations and intentions. As concerns about artificial intelligence and digital addictions arise, we collectively unplug and amplify the inner organic screen, sending healing, support, and light codes through pure intent. Join us in the pure organic Ascension as we call forth spiritual disclosure, revealing our Divine HUman skills. Meditate with us on SUNday at 8:11am, 11:11am and 5:11pm Pacific Time. We unify for 33 minutes of peaceful intent to assist the Ascension. All are valued and welcome. We Love You, We Bless You, We Thank You. We are in our Sacred passage in this Now. It is our Divine right to utilize this opportunity for a brand new experience. To become the New. Remember to demonstrate non-judgment, forgiveness, neutrality and gratitude as revelations come to light, even within the Lightworker collective. Show the way, Wayshowers; sometimes silence is the best teacher. The vibration of LoveLight dissolves all distortion, and deserves your complete focus. We are all one BEing; the wayward parts of us – global and personal – are best healed with patience, compassion and understanding. Your support for this work is welcome, thank you for a gratitude donation!